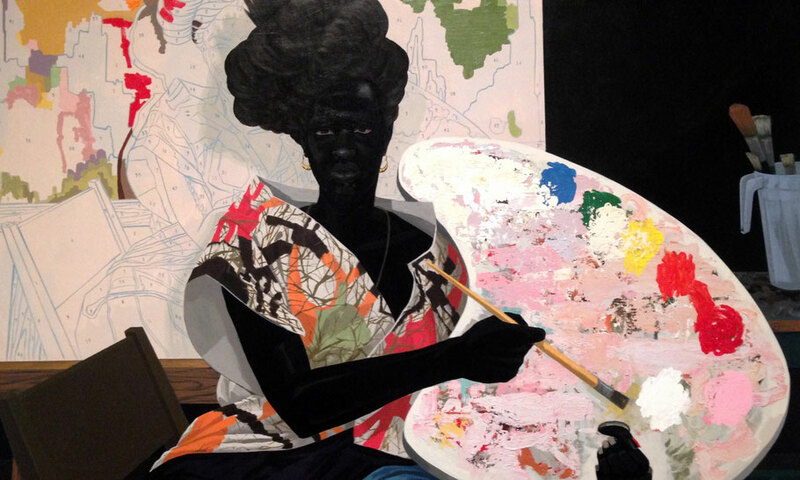 Artist Kerry James Marshall was born in Birmingham, Alabama. He lives and works in Chicago. As he describes, his work is rooted in his life experience: “You can’t be born in Birmingham, Alabama, in 1955 and grow up in South Central (LA)] near the Black Panthers headquarters, and not feel like you’ve got some kind of social responsibility. You can’t move to Watts in 1963 and not speak about it." Strongly influenced by his experiences as a young man, he developed a signature style during his early years as an artist that involved the use of extremely dark, essentially black figures. These images represent his perspective of African Americans with separate and distinct inner and outer appearances. They also confront racial stereotypes within contemporary American society.